The average cost of installed residential and commercial photovoltaic systems in the U.S. has dropped by 12% from last year and 45% from 2010. 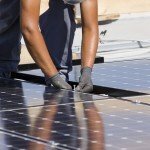 For a skilled professional PV installer or Technical Sales Rep, there is considerable opportunity with over 14 solar companies in Mississippi. To find out more about the specifics of solar companies and solar installations you can visit the Solar Energy Industry Association’s (SEIA) website, www.seia.org/state-solar-policy and select your state for in-depth solar installation information specific to your area, or, see the Database of State Incentives for Renewables and Efficiency (DSIRE) at http://www.dsireusa.org/ where you’ll find extensive tax and financial data specific to your state.